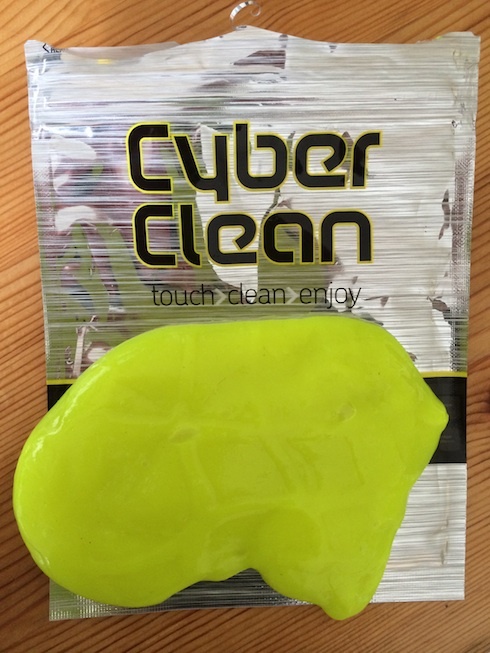 Cyber Clean Cleaning Compound is fluorescent green and what you can only describe as gloop! It’s for cleaning all the nooks and crannies in computers and mobile devices that you can’t usually reach. It comes in a tub or or resealable smaller pouch. The compund changes colour as it cleans, so there’s a colour patch on the packaging so you know when to replace it. You roll the gloopy substance into a wad and press it down into your keyboard and computer ventilation grilles, so it picks up the dust and dirt lurking there. Apparently it kills 99.9 % of germs. Not bad when the story goes that some keyboards are dirtier than toilet seats! I regularly clean my keyboard, especially during the summer when the keys get sticky, so that wasn’t much of a challenge. I tried the Cyber Clean Cleaning Compound on the on/off button, which is difficult to clean and some fragments of the compound were left in it when I pulled it off. I rubbed the compound over it and they came off, and I’d say it was a bit cleaner. After going over the keyboard there were little black specks on the gloop, so obviously it picked up dust I couldn’t see. It made a mouse very smooth and shiny, and black shiny surfaces like the hard drive seemed to stay dust-free longer than usual after they had been cleaned. It cleaned up a MacBook keyboard and a couple of calculators like new. I found the scent a bit much, but I do seem to have a more pronounced sense of smell than most people. I didn’t like the feel of the compound on my hands, so I used rubber gloves. I also wiped the keyboard with a damp cloth afterwards because I could still smell and feel traces of the cleaner. Cyber Clean Cleaning Compound makes a boring job like cleaning quite good fun, but the packaging says you must keep it away from children, who will love its slime-like qualities! We’ve used it on quite a few items and the colour hasn’t changed at all. cleaning up dusty keyboards, calculators, phones, printers etc. You won’t believe how different they look afterwards! Ideal present to encourage your man to clean up his digital boy’s toys! Not for those who prefer natural cleaning products. With thanks to Cyber Clean for sending a sample pouch of Cleaning Compound for review. Buy Cyber Clean Cleaning Compound.